Below is part 3 of The Odyssey Odyssey—enjoy! And if you have questions or observations, just make a comment here, or post to Twitter or Facebook. In 1987 I got away from scriptwriting. I was back at the Insurance Corporation; I became a Buddhist and took up meditation; Kimmie and I bought a townhouse together; and I was working on my New Age thriller novel, Truth of the Python. I recall that Warren and I prepared more material for our would-be TV series Flash Dispatch, ideas for episodes for a first season, plus a description of how each episode would look and feel, and descriptions of the characters–material that in the TV world constitutes the “bible” of a series. Michael Chechik got the material in front of CBC drama executives in Vancouver, but their verdict was that the pilot script did not live up the potential in the accompanying material. But later that year, CBC headquarters in Toronto, no doubt responding to ongoing prodding and complaining by independent producers across the country, and making one of their occasional token efforts to give substance to their mandate to be a “national” broadcaster and not merely a Toronto broadcaster, came up with the idea of producing an anthology of one-off half-hour dramas from non-Toronto producers (that is, from “the regions”, in CBC-speak). The intent was to give producers in “the regions” a chance to get some experience in producing drama for the CBC, and, of course, to give voice to “regional” perspectives from across Canada. It will help Canadians learn more about each other! Just what the CBC is supposed to promote! Warm glows all round. The anthology was to be called Family Pictures, and the theme was Canadian family life. CBC corporate ambassadors were sent out to meet with “regional” producers to explain the concept and give them documents describing what the network was looking for in the dramas. Michael was at the Vancouver meeting, and he called Warren and me up to suggest that we come up with an idea to pitch to the CBC. We said sure. I came up with an idea. It was on 7 December 1987. I thought back to when I was in grade 7 at Brooksbank School here in North Vancouver, when I heard a rumor about a boy in another grade 7 class who had passed a love-note to a girl in the class, and the note had fallen into someone else’s hands and then been made public. I don’t know whether that actually happened, and I don’t recall the boy in question acting any differently than usual (strange in any case), but I thought: what if we wrote that story, and had our lover-boy feel, in his humiliation, that he can’t return to school ever again to face his peers? We wrote up a couple of pages of material sketching the story and gave them to Michael. He sent them in to the CBC, and we waited. A few months later (fast in TV-show-development time), probably early spring 1988, I got a call from Michael: the CBC liked our story and wanted to go to script. Wahoo! I experienced the next big leap forward in “realness”: it wasn’t just a producer now who was interested in my work–it was a network, the people who would actually pay for it to be produced, and then broadcast it! Jubilation! But I didn’t quit my job–not this time. This was only a one-off half-hour drama, and I had two mortgages now. Warren and I would have to write in our available off-job time, as when we’d written Flash Dispatch. But now we were not on conflicting shifts; I was on days and it would be a lot easier. Michael held a meeting at Omni in which we met with Jana Veverka, the story editor contracted by the CBC to supervise the writing of the scripts for Family Pictures. (Later she’d go on to produce TV shows such as Bordertown and Airwolf.) As I recall, that first meeting was still in the Omni suite on the 11th floor of the Dominion Building. Jana was very positive about the story idea, and liked the fact that our hero was a nerdish love-sick 12-year-old. Her concern was that there might not be enough story there to fill a half-hour of TV. “There’s plenty there,” we said. We saw some nice farce opportunities in the story. There: we’d just had our first meeting with a network representative–our first “story meeting”. We were on our way. 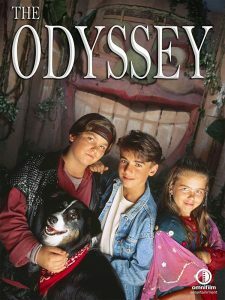 This entry was posted in the odyssey and tagged canadian broadcasting corporation, dominion building, fantasy, flash dispatch, jana veverka, michael chechik, Paul's life, ryan reynolds, story, the odyssey odyssey, Truth of the Python, tv series, warren easton, what's wrong with neil?, writing fantasy, writing for tv. Bookmark the permalink.